A delicious sponge cake filled with an incredible cream filling and topped with a rich chocolate ganache! This is one unforgettable recipe that is a complete show stopper! I cannot believe it is May already! Mother’s Day is next week, which got me thinking about desserts my own mother loves. Boston Cream Pie happens to be one of both of our personal favorites! Boston Cream Pie is a weakness of mine! I absolutely adore the cake, cream and chocolate combo! It is a heavenly combination! Then it dawned on me… why not make this into a cake roll?! The end result was AMAZING! 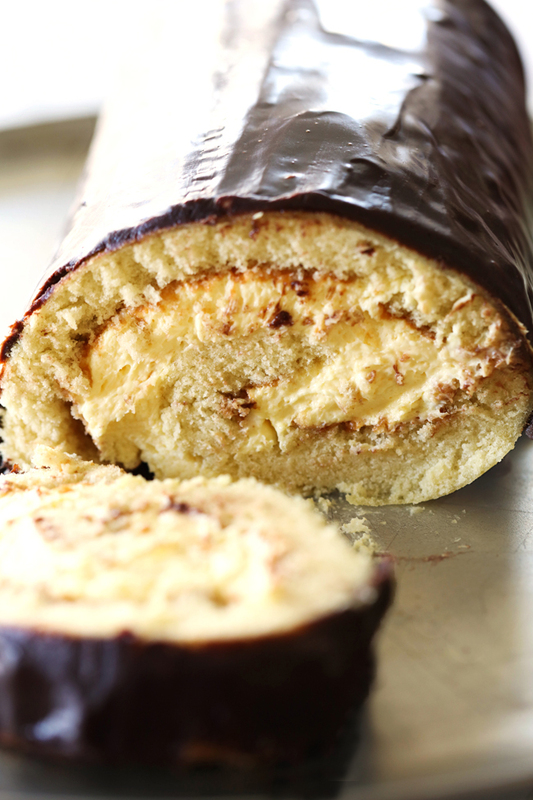 The cream filling is made with my Easy Bavarian Cream recipe and it was the perfect compliment to the sponge cake and the rich chocolate ganache. I made this for a family dinner and people were coming back for second and thirds and the cake roll disappeared within minutes! If you need a dessert that will wow your company give this one a try! You will not regret it! Line 15x10x1 with parchment paper. Grease with 2 Tablespoons butter. Sift flour, baking powder and salt into a smaller bowl and add half of it into the egg mixture. Gently mix until smooth. Add the other half and gently mix again. Sprinkle greased jellyroll pan evenly with the 2 remaining Tablespoons of sugar. Pour batter into the pan and spread it evenly over the pan evenly to all edges and corners. Bake about 12-15 minutes. Cake is done with it springs back when touched. Cool for about 2 minutes and then gently flip it out onto upside down onto towel. Carefully peel off parchment paper. 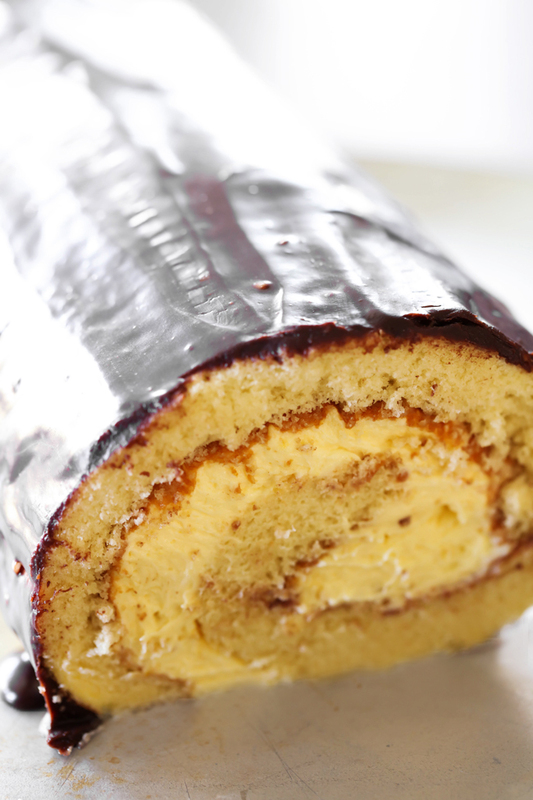 While cake is still hot, carefully roll cake and towel from narrow end. Cool on cooling rack at least 30 minutes. While cake is cooling, prepare filling. Click here for the Easy Bavarian Cream recipe. When cake roll is cooled, unroll the cake remove towel. Carefully spread cream filling over the top of cake. If it seems to thick, add a little more milk a Tablespoon at a time until it is a tad bit thinner. Carefully roll up cake. In a small microwavable bowl combine chocolate chip and half and half. Microwave on high for 45 seconds. Stir and repeat in 30 second increments until chocolate is melted. Add powder sugar and stir until smooth. Carefully drizzle and spread over the top of cake. Refrigerate for it least 2 hours before serving. This cake roll is insane! Boston Cream is also my favorite!!! Super recipe - what technique did you use to spread the ganache all around the cake role (even the bottom) - thanks! I just used a frosting spatular, let the frosting drip on the sides and carefully spread before it set. I hope that helps :) Please let me know if you have any more questions. When do you add the 2 tbsp of butter? It says to grease the pan with the 2 tablespoons of butter. So sorry for the confusion. Hope that helps :) Please let me know if you have any further questions. Do you cover the towel with powder sugar before putting the cake on it? One would think rolling the cake in just the towel would cause the cake to stick to the towel. Just asking because most jelly roll cakes are done with the powder sugar on the towel to prevent it from sticking to the towel.